But there is an opportunity to take away the worry from chronic diseases and lighten the burden for the patient, their loved ones, and the healthcare system. The Medly mobile application was developed to support patients with two or more chronic conditions and their clinicians to better manage symptoms and enable real-time feedback. 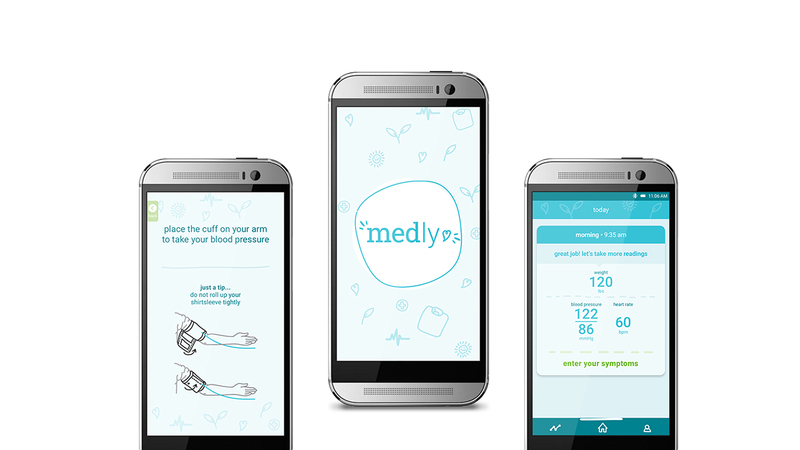 Medly is connected to bluetooth-enabled devices, so that patients can record their data such as daily blood pressure readings and weight to make sure they’re on track. Users can also send and receive information about medications, lab results, educational materials. The clinical care team can remotely monitor the user’s health status and be notified through automated alerts when their patients experience abnormal symptoms. With an open and readily available communication channel, the patient can worry less and get back to doing the things that make them happy. Healthcare Human Factors is leading the product and service design of Medly. We designed the entire process from the moment when the patient receives Medly from their doctor, sets up the app, brings it home for everyday use, to their next visit to the doctor. We held workshops with the clinic to ensure that the process aligns seamlessly with the existing clinical workflow. At every stage, we ensure that with Medly in hand, the patient will feel more empowered, in control, and happier. Our team has worked closely with Medly from the inception of the app, to its first randomized controlled trial, which demonstrated improvements in heart function and self-care,6 to its deployment today. The Medly app is now being operationalized at the heart failure clinic at University Health Network, one of the largest hospital networks in North America. There, Medly is being prescribed by the clinician to the patient to take home, as they would with any prescribed drugs. Moving forward, we will be working with other clinics and hospitals to implement Medly, and change the lives of those with multiple chronic conditions. 1 Global Status on Noncommunicable Disease. World Health Organization. 2011. 2 Mirolla M, The Cost of Chronic Disease in Canada, GPI Atlantic Jan 2004.